It's no coincidence that (epic) fantasy fiction--along with the other legatees of the 19th century Romantic movement, horror, romance and, to a limited degree, science fiction--emerged in the context of late capitalism and its fellow traveler, scientific rationalism. After all, these forces were among the primary contributors to what social theorist Max Weber called "the disenchantment of the world," the slow retreat of myth and superstition as building blocks of reality. Many aspects of that disenchantment have been positive for human development, but Weber reminds us that other aspects are not. After all, 99% of human history has been decidedly enchanted, and the loss of that can lead to feelings of alienation, atomization and other negative things. Fantasy fiction, then, serves as a sort of escape from the world of cold, hard facts, and provides a tether to what's missing from our 1% of human history. When we travel to fantasy worlds, we are traveling to places and times where the barriers between the physical and metaphysical have evaporated. And when it works, fantasy fiction gives us an infusion of enchantment to get us through our disenchanted lives. Whether they realize it or not, this is probably why most fantasy readers read fantasy. There are, of course, many flavors of fantasy, and we aficionados inevitably have our favorite corners and niches. One of mine has, since childhood, been what you might call the "thieves, rogues and assassins" style, where where stories are set, for the most part, urban rat mazes of the pre-modern underworld and where protagonists succeed as much by luck and wits as by sword or sorcery. As an adult, I've made a few forays back into this soup, hoping to rekindle the magic I felt as a youngin' reading Fritz Leiber's classic Fahfrd and the Gray Mouser stories or the latest entry in the collaborative Thieves World series. I have been mostly disappointed. 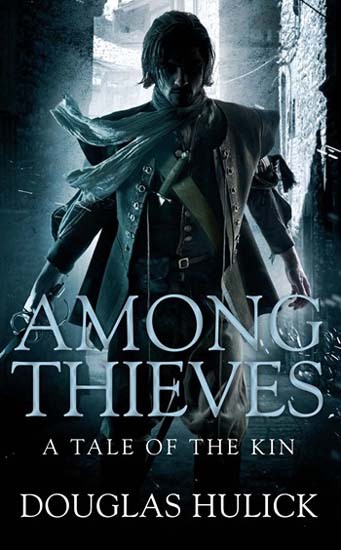 So when Douglas Hulick's novel Among Thieves was recommended to me, I was naturally curious to see if I'd finally found the "thieves, rogues and assassins" book I've been looking for. In truth, things didn't start out well for me--the opening scene is a graphic, cruel and very long torture scene. If you are a regular reader of this blog, you know how I feel about this kind of thing: only if it's necessary and only if it does something very important for the story that can't be achieved through less gratuitous means. The bad news is that this torture scene is not and does not. The good news is that it's also completely unrepresentative of the book as a whole. And though there is plenty more violence, from this point forward it feels well considered, restrained and integral to the story--which, I might add, is a hell of a story. At its heart, Among Thieves is a thriller, and the first-person narrative (centered on a stubborn protagonist with an unusually strong sense of ethics as he navigates a dangerous and duplicitous world) feels more typical of crime fiction than fantasy. And that's a good thing: the first mark of good crime fiction is a steady pace, and the limits of first-person are well-suited to the building of tension. Of course, it helps that Drothe is likable, relatable and, best of all, believable. He's no ace, but he has a certain something that keeps him alive and confounds those who think he can be manipulated or brushed aside. A lot of credit for that goes to the people he surrounds himself with--best friend and fencing master Bronze Degan, sister and Baroness Christiana Sephada, bodyguard Fowler Jess, the Djanese sorcerer Jellum and crafty gangster Kells. As with Drothe, Hulick presents these characters as individuals with interesting and meaningful subjectivities of their own, something he also does with the book's numerous and memorable villains and ne'er-do-wells. The best part of Among Thieves, though, is the world building. I use this term with some hesitation, given its association with the perceived "need" felt by some SF/F authors to litter their novels with wikipedia-style infodumps and heaps of useless and distracting errata. But the construction of rich and immersive secondary worlds is an essential element of epic fantasy, and the degree to which an author succeeds or fails to do so has a disproportionate bearing on the fantasy novel's success. Keeping that in mind, I can say without hesitation that the world Hulick builds is as rich and immersive as any I've come across in recent memory. For Ildrecca and the Empire, Hulick takes medieval Byzantium as its starting point, and then peppers it with a healthy dose of Renaissance Italy and to that adds layers of refreshingly original make-believe. It would take me ages to get into all the details, so suffice to say that I found the social structure of Ildreccan society (and the parallel criminal society, the Kin), as well as the theological underpinnings of the state, endlessly fascinating. Not only are these sociological elements well-developed, they are also pervasive, internalized and internally consistent--no small feat. I also found myself enjoying the fencing scenes--much more than normal. I've come to understand that Hulick has a background in rapier combat, and it shows in the best possible way. Though occasionally over long, some of the book's best moments come as Drothe desperately tries to extract himself from one fight or another. Of course, as with most debut novels, there are some issues. While the plot is generally well-paced and exciting, it does get overcomplicated at times. There are a few too many moving parts and a few too many dangled threads. As a result, some of the book's characters feel as they were introduced to great effect, only to be underutilized in the end. And there is that rather ghastly torture scene, which doesn't add anything and feels awfully out of place too. Bonuses: +1 for the exquisite world-building; +1 for the great characters. Penalties: -1 for the moments when the story got tangled up in itself.